Before I get into the days happenings let me bore you with all of the pennies I’ve accumulated in the Wisconsin Dells. Yay tacky souvenirs! Alright now let’s get to it. Getting up early is the secret to doing anything in the Wisconsin Dells. 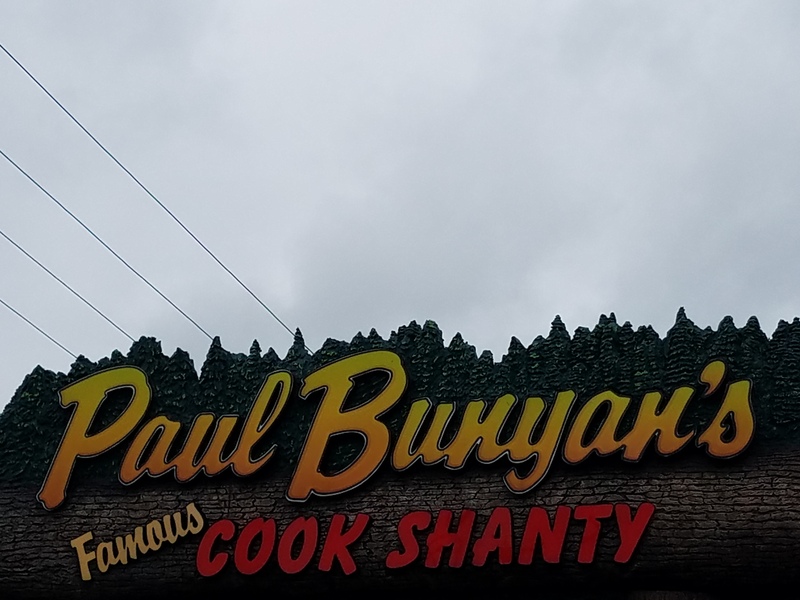 I made it to the Paul Bunyan’s Cook Shanty before the crowds! It’s served family style which doesn’t work well when you’re alone. It begins simple enough with a warm, fresh doughnut…. Look at how terrible that picture is! Shameful! If you can’t see, it’s breakfast potatoes, pancakes, scrambled eggs, biscuits and gravy, ham, and sausage links. Travis expected me to eat all that and then ask for more? Travis, you’re ridiculous. Besides I know good biscuits and gravy. Your gravy doesn’t even have sausage! What the hell, Travis? Your gravy game is weak. With little else to do, I walked from my room to Broadway and took a tour of the H.H. Bennett studio. He is not to be confused with H.H. Holmes the Chicago serial killer. H.H. Bennett was a clever photographer from the late 1800s. When planning this trip I looked into buying a special camera that would allow me to make 3D pictures for a view-master. I gave up that idea when it seemed too hard and I remembered I can be kind of lazy. Bennett didn’t give up as easy as me however, and he created a way to make 3D pictures…in the late 1800s. That’s impressive. His nature photos are responsible for the tourism trade in the Dells but his most famous is of his son Ashley jumping things. For the record, the distance between the two rocks is designed into the carpet at the Bennett studio. I totally jumped that same distance. Ashley Bennett isn’t as hot as he thinks he is. Being pretty full of myself I went to the D-Day Invasion Park. I’m afraid of heights so I was pretty psyched to have climbed the ropes, scaled the ladders, and navigated the obstacles to make it to the chopper 4 stories up! I was sitting, overlooking the parking lot feeling proud of myself until a 10 year old pushed me out of the way for a look. Brat. After the first bar I remembered a BOGO coupon for mojitos in my room! SCORE! It’s .7 of a mile from my hotel room to the Dockside Rum Bar. That’s nothing! I scurried over for my mojitos and was quickly rewarded! Delicious! Dockside also infuses their own rum creating two signature cocktails. Cristian, my Romanian bartender and new Facebook friend, made me 3 mojitos and a Bim-Bam-Boo while we hung out for a few hours. He schooled me on Alex Velea and Transfagarasam. He’s only in the Dells until October, so hurry and see him! After that he’s heading back to school in Romania where he’s studying civil engineering. The couple of hours I spent talking to him were some of the best I’ve spent in the Dells! Good people! I owe him a drink when I’m in Germany next year. Why quit when you’re ahead? I had one last place I wanted to visit before leaving the Dells. Buffalo Phil’s restaurant is like a frontier land version of Dave and Busters. It’s a restaurant/bar/arcade but in a giant log cabin. What really makes it unique is that a toy train delivers the food to your table! The good news is they didn’t get mad when I was oblivious to the butter and diet coke they drove?…trained?…served me. The bad news is they wouldn’t send my 3rd shot via railway. This is what’s killing rail as a legit mode of transportation. My next 2 days are going to be arduous. I will be driving from the center of Wisconsin, through Minnesota and North Dakota, to western Montana. I’m really hoping I don’t have to start that drive with a hang over tomorrow. Oh well, decisions were made and shots were taken. Did you happen to meet Del Wilkes in TheDells? He would make a a good travel partner for you. When does the PG-13 part start? No comment today on the drinks. Just be careful. Love you. 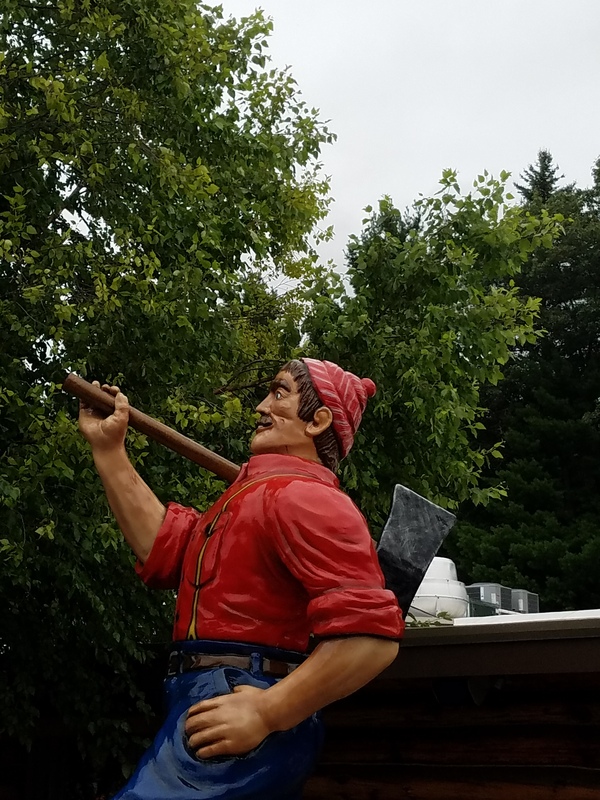 Glad you made it to Paul Bunyan’s Cook Shanty. I wasn’t sure if it was still there. I remember it having awesome food.